Fred Williams’ deliberate yet vivid depictions of the Australian bush are the product of his truly unique approach to landscape. In contrast to the Antipodeans (from which he was famously excluded), Williams was less interested in the mythologies of Australia’s past than in observing and absorbing the present. In doing so, he invented a form of visual shorthand for the Australian landscape, which allowed him to capture the eternal bush with apparent immediacy and lucidity. In the early 1960s, Williams began making excursions to areas around Melbourne where he would paint en plein air with gouache, quickly capturing the light and conditions of the landscape around him. Wilsons Promontory is a fine example of Williams’ outdoor paintings of the rugged Australian landscape. Williams had a keen appetite for dissecting all before him in painterly notations that allowed him to document extensive areas of the Australian bush in gouache and oil on paper. Williams’ circle of friends included many prominent artists such as John Brack (1920-1999), but he did not belong to any artistic group. He was an individual, an explorer armed only with his brush and his imagination. Omitting any obvious focal point, Williams frequently chose to paint areas of the Australian bush that previous artists had neglected. Nevertheless, he drew influence from Charles Conder (1868-1909), Arthur Streeton (1867-1943), John Russell (1858-1930) and Walter Withers (1854-1914), especially with regard to their interpretation and treatment of light. 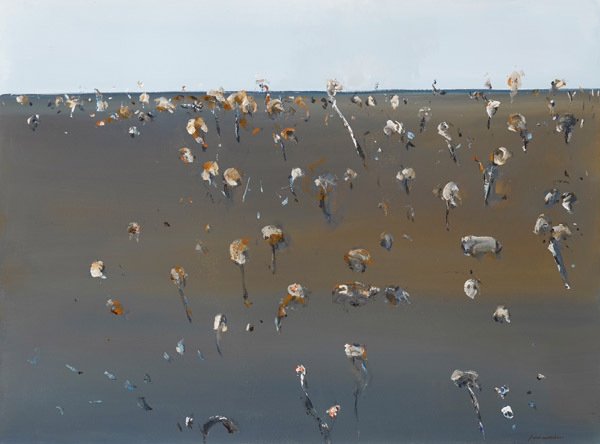 Fred Williams is an undisputed leader of Australian landscape painting and is held in high esteem by both Australian and international audiences, as the only Australian artist to have been honoured with a solo exhibition at the Museum of Modern Art in New York, in 1977. Wilson’s Promontory further attests to his mastery of medium and subject.